Firearms constitute a great threat to human rights, and even more specifically to women’s human rights. For the 32nd session of the Human Rights Council, the Office of the High Commissioner for Human Rights (OHCHR) has issued a report tackling these issues, aiming at identify the impact of the use, acquisition and possession of firearms by civilians on the enjoyment of human rights and women’s human rights. 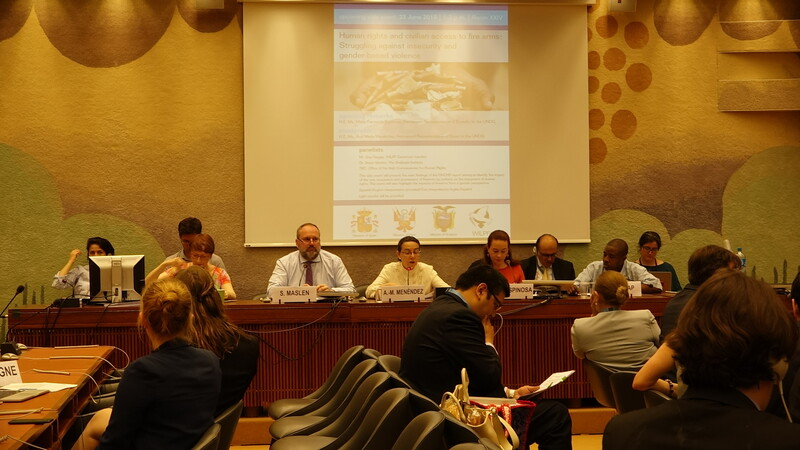 In this context and with the participation of the missions of Ecuador, Peru and Spain, WILPF held a side-event on 23 June highlighting the impacts of firearms from a gender perspective. Nathalie Prouvez, from the OHCHR, made several crucial points. She first pointed out that firearms were widely used among civilians and that they were the primary medium for human rights violations and abuses (86% of the homicides involving firearms are occurring in non-conflict zone). Human rights abuses are even more striking when we recall that firearms are not only used to kill, but also to threaten and intimidate. In this way it touches on women’s human rights, through sexual and domestic violence for example. Furthermore, the fear of this threat in daily life limits the enjoyment of economic, social and cultural rights. 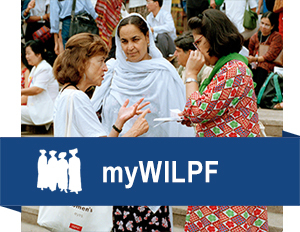 Women get a limited access to healthcare, education and participate less in the community life. Therefore, not only the misuse, but also simply the presence of firearms has an impact on adequate living. The role of states is crucial in terms of regulating the framework that may allow the circulation of firearms; the regulation should be much stricter. Public policies are very important and states must adopt due diligence and protect individuals without neglecting the private sphere, which often tends to be left aside. The framework of the Agenda 2030 is a major step forward. Guy Feugap, a member of WILPF Cameroon, presented a more pragmatic approach. He highlighted the fact that, in Cameroon, gender-based violence not only comes from old traditional practices but also from a weak legislation. Indeed, firearms are allowed for hunting and for personal protection, but there are many unregistered weapons, either family inherited or homemade. Of course, this is increasing domestic mortality and violent masculinities, in a context where gender equality is not achieved. Guy Feugap backed up his argument on a series of striking facts, always illustrating the power relation between women and men. Guns, in the hands of civilians, are a danger to the life and the rights of women. They can be used in any simple argument and become a tool of threat and coercion, therefore impacting the life of the communities. It is important for the access to weapons to be more regulated, without forgetting homemade firearms. In this context, existing regional and international agreements should be implemented and deepened, in order to fight the proliferation of weapons but also to protect women’s rights. There is clearly a lack of data on the gender impact of the possession of firearms by civilians, and gender studies on this topic should be developed. Stuart Casey-Maslen, from the University of Pretoria, advocated for a better and much stricter regulation on firearms worldwide. He also raised the issues of children owning firearms, especially in the US. Partly thanks to the OHCHR report on firearms, it is recognised that the use of firearms and the widespread ownership among citizens is not only impacting the right to live safely but also economic, social and cultural rights. The stronger impact on women’s rights has also been acknowledged. The issue is now integrated into the Sustainable Development Goals, and this is a major step forward.